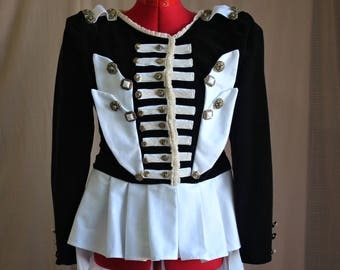 Announcement VENTRILOQUIST COURT® is an alternative fashion & textile art costume line specialising in custom-made Avant-Garde, Romantic, Bohemian, Steampunk, Circus, and Visual Kei attire inspired by nostalgia for the bygone 'era of Tea.' All items are designed & handmade in Sydney, Australia by Rai Keodara. 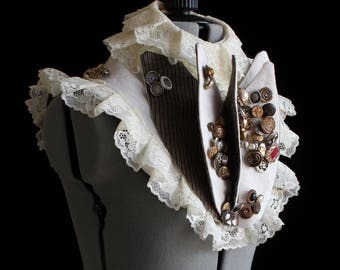 Launched in December 2013, VENTRILOQUIST COURT® offers made-to-order custom garments celebrating textile creativity in fusing alternative fashion and costumes with a love for antique books, paper scrolls, tea-dyeing, and past-era charms - with a modern twist! The label is honoured and greatly humbled to have reached international customers as far as the UK, the USA, Canada, Germany, Sweden, Slovakia, Ireland, Japan, France, and Switzerland. VICTORIANALAND (Fantasy Textile Art Gowns) - new designs will be released throughout 2019! FAQ: What sizes do you offer? There are two types of listings in the store - custom size (tailored to fit you), and standard size (XS- XL - suitable for gift purchases for a loved one). Please take your time to view all the photos and to read the description. FAQ: Which international countries do you ship to? Ventriloquist Court® ships to the following international destinations: USA, Canada, all of Europe, New Zealand, Japan, and the rest of East Asia. 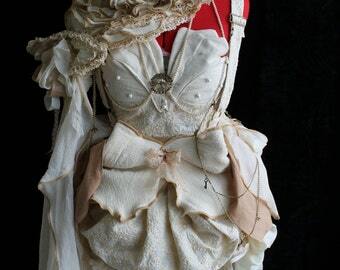 VENTRILOQUIST COURT® is an alternative fashion & textile art costume line specialising in custom-made Avant-Garde, Romantic, Bohemian, Steampunk, Circus, and Visual Kei attire inspired by nostalgia for the bygone 'era of Tea.' All items are designed & handmade in Sydney, Australia by Rai Keodara. 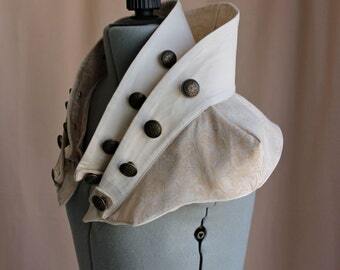 Launched in December 2013, VENTRILOQUIST COURT® offers made-to-order custom garments celebrating textile creativity in fusing alternative fashion and costumes with a love for antique books, paper scrolls, tea-dyeing, and past-era charms - with a modern twist! The label is honoured and greatly humbled to have reached international customers as far as the UK, the USA, Canada, Germany, Sweden, Slovakia, Ireland, Japan, France, and Switzerland. 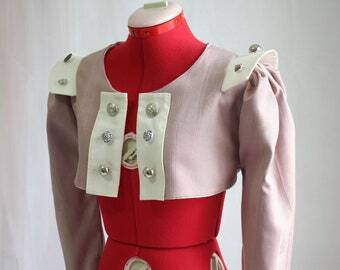 Size S Sample Sale Dusty Pink Avant-Garde Steampunk Bolero Jacket Ready to Ship! This blouse is gorgeous; the cotton is luxurious and soft with some stretch, and the lace is so pretty. 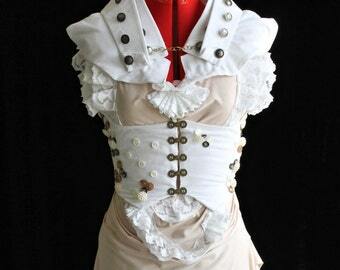 This is a very romantic blouse. Rai added some extra length for me and it fits perfectly. Wonderful communication. She also added beautiful gifts which I love too! Thank you so much for being with me the whole time (measurements, pictures during process, etc.). This was a real experience and your work is just fantastic! This is really a perfect hand made collar! Thanks a lot! Beautiful Indian handwoven cotton organdy. 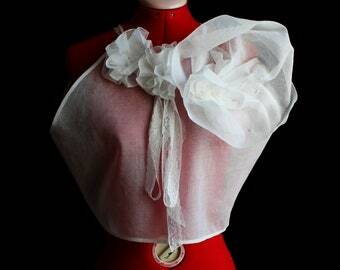 Love working with this sheer white & crispy fabric which holds body so well to create the Modern Poetess collection! It was definitely worth the months of wait for this fabric to come in from the weavers! VENTRILOQUIST COURT® is an independent label of antiqued and avant-garde fashion and costumes designed and handmade in Sydney. Born in December 2013, the label first began as an Etsy crafts store with a couple of fashion items in its first few months. 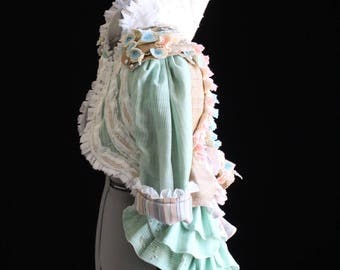 However, as one garment design followed another, it soon grew into a Victorian-inspired fashion line of Romantic Cottage, Bohemian, Woodland, Steampunk, Gothic, Visual Kei, and avant-garde attire. VENTRILOQUIST COURT® was born from both my reaction against Sydney conservatism and from my newfound passion in alternative fashion and fine art photography. Growing up in Sydney and thus largely restricted to mainstream consumption, I've always found the search for unique gifts rather disappointing. This prompted me to self-learn sewing and to make craft items for family and friends. Having received positive feedback on my 'antiqued' crafts over the years, I then wanted to try my hand at 'antique' costume design. The result: I had found my true calling. I had a knack for design, as well as for the more technical aspects of pattern making, sewing, crafting, and tailoring garments. As one idea would always give birth to another, I was fortunate enough to be able to add a humble collection to my name by late 2014. This period in my life coincided with a growing interest in alternative fashion photography as a hobby photographer who was bored with Sydney's conservative culture and attitudes. What started as crafting antique-style props for my own photo shoots grew into a line of crafts and then costumes with an emerging 'Tea Alternative' style, which has broadened today to include a range of alternative styles. The word 'art' has become commonplace - used in association with such examples as music and song writing, poetry and other forms of literature, traditional as well as abstract art whether in sculptural form or even in performance and so on - making it almost impossible to define. For me, my work is also an art form, though I am fully aware that this reference would provoke protest from elitist circles and overseers of Art (with a capital 'A'). I strongly disagree with the use of the label 'superficial' to belittle all fashion. Consumption of art in galleries and museums is deemed high culture, and yet to show passion for art in the form of garments and accessories displayed on the human body is somehow superficial. I hope that my collection of 'art' will help change attitudes and encourage the appreciation of art in all of its varying forms. The majority of Ventriloquist Court®'s garments are made from natural fibres, including Australian-made cotton, European linen made in Lithuania and Belarus (Oeko-tex Standard 100 Certified), artisanal cotton and peace silk from India, and vintage cotton velvet made in Germany. I do use some man-made fibres; for instance, polyester felt made out of recycled plastic bottles (USA-made fabric). 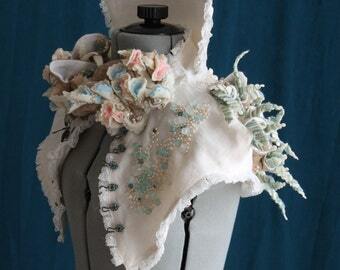 I also use vintage cotton lace trims and organic cotton tape zippers where available. My favourite embellishments to work with are recycled glass beads, vintage plastic beads, and vintage Czech glass buttons. 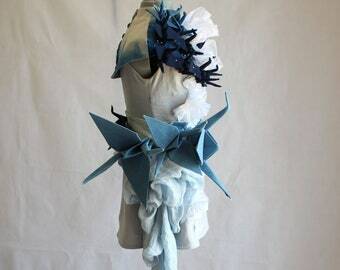 Each listing provides a description and list of materials used to construct the garment. Questions concerning materials are more than welcome! Ventriloquist Court® aims to promote a sustainable vision and vegan-friendly alternatives. All garments are vegan, with the exception of some which use silk. However, I only use peace silk, which is harvested from empty cocoons which have been discarded by the silk worms as they emerge as moths as part of their natural life cycle; the fabric is handwoven by Indian artisans. I am a long-time vegan who is open-minded about peace silk and appreciate its contribution to artisanal communities in India and elsewhere. I fully understand how challenging it can be to find alternative garments which are eco-friendly but also suitable for costume events. However, currently no certification body exists to oversee the cruelty-free production of peace silk. Customers are more than welcome prior to purchase to make requests for a quote for a change in fabrics and materials; for instance, where available, linen could be substituted for silk, or plant-dyed handwoven cotton for regular cotton, etc. Although it is still early days, my greatest hope is for VENTRILOQUIST COURT® to develop into a fashion line known for a creative and unique artistic vision and for a progressive and inclusive philosophy of offering handmade and made-to-measure garments at reasonable prices for the quality of materials and time involved in designing and creating each garment. Ventriloquist Court is proud to be listed on Greenfinder, Australia's Directory of Green Businesses! 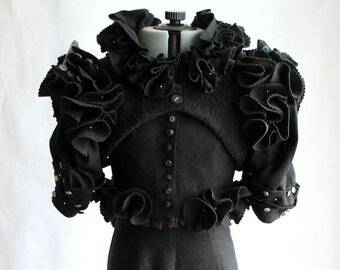 Hi, I'm Rai - a 33 year old alternative fashion designer & textile artist from Sydney with an arts background and a love for all things Victorian and steampunk! Welcome to VENTRILOQUIST COURT.® All Romantic Cottage, Bohemian, Steampunk, Gothic & Visual Kei Attire in the store are designed and handmade in Sydney, Australia. If the garment arrives damaged or does not fit, please send me a message within 3 business days of receiving your package with photographic proof of ill-fitting or damage. Once I receive the returned garment, I will send out a replacement as soon as possible. Please read the following policies on exchanges. FOR EXCHANGES for a new size or a replacement of the same size, customers are required to return the garment to me within 7 business days of delivery - that is, the garment must be lodged at the post office and sent with a tracking number by the customer within 7 business days of delivery. Of course I will gladly pay for return shipping upfront. I will then send out the replacement to you, upon receipt of the garment. If the new size requested is already-made, I will send this out within 1 business day of receiving the returned garment. Otherwise, if I need to make a new garment, I may need a few days at the very least. Please rest assured that I will work as solidly as possible to send out the replacement to you as soon as possible. Returns for a full refund on the basis that customers have changed their minds about a purchase is not accepted. Greatest apologies, however, much time and effort goes into the hand-making of each garment whether made-to-order in standard size or custom size. Ventriloquist Court®'s no refund for completed orders policy is a little strict, but this safeguards against fraudulent purchases. If your package sent via economy airmail (i.e. sent with no tracking and no signature confirmation) has not arrived by 15 business days for Australian orders or 25 business days for international orders, it will be considered missing and I'll offer a full refund! I accept several payment methods: credit card, debit card, Etsy gift card, Paypal, or Apple Pay. Credit/debit cards accepted are: Visa, MasterCard, Discover, & American Express. Direct payment using a credit card and debit card is processed by Etsy, which uses SSL encryption and does not share the financial details of buyers with sellers. This payment method also offers the added benefit of Etsy's buyer protection. The following articles may be helpful for customers new to direct payment. I also accept payment via Paypal, which also does not share any of your financial details with sellers. Customers who do not have a Paypal account can also checkout as a 'guest' and not be required to sign up for a Paypal account. International customers who are already familiar with their country's customs laws may like to skip to the 'FAQs' section further below. Otherwise, please take the time to read the following relevant sections on customs. The tax-free limit on buying from Australia varies by country. Although I have done my best to provide as much information as possible (last updated 02 April 2019 to assist first-time international customers buying from Australia, please check with your country's customs office, for the latest information. If you have any trouble with finding the relevant websites or have questions about customs taxes such as VAT, please do not hesitate to get in touch with me. I fully understand how important it is for international customers to have an idea of whether they would need to pay any customs taxes and how much. Excellent news! Effective from March 2016, USA customers (except those US states mentioned below) only pay customs taxes (duty) on Australian goods if the product value is over $800 US dollars. The postage fee is not included in the $USD 800 value limit. The following US states now impose sales tax on online purchases: Washington, Pennsylvania, Oklahoma, Minnesota, Connecticut, South Carolina, Iowa, South Dakota, New Jersey, District of Columbia, and Alabama. Etsy automatically adds sales tax to online purchases made by customers residing in these states, which simplifies the process of sales tax collection! The sales tax rate for purchase of clothing varies across these US states, but customers will see the amount taxed in their shopping cart. There is, however, a small merchandise processing fee of only $2 USD payable to the US government via your local post office. Take advantage of the currently low Australian dollar and order a unique garment today! UK customers only pay VAT import on Australian goods with a total product value exceeding £15 (the product value excludes shipping costs). The current VAT rate is 20% calculated on the total product value + international shipping. For instance, if UK customers purchase a blouse costing $99 AUD (= around £45) and let us say that the postage is $16 AUD (= £6), they would pay a VAT rate of 20% of £45 + £6 = £10 (which is about $21 AUD). Note: UK customers will only pay VAT import (as explained directly above) + a handling fee of £8 to Royal Mail, but will never have to pay additional postage to Royal Mail when purchasing from Ventriloquist Court. Customers residing in Germany only pay VAT on Australian goods with a total product value exceeding €22 (the product value excludes shipping costs). The VAT rate is currently 19% calculated on the value of the goods + international shipping + any import duty due. For instance, if customers purchase a skirt costing $120 AUD (= around €74) and shipping is $22 AUD (= around €14), they would pay VAT only (i.e.19% of €74 + €14) but no duty. In this case, the VAT rate is around €17. Canadian customers only pay customs taxes on Australian products with a product value exceeding $20 Canadian dollars. Products over this value attract duty and sales tax, which varies by province. For example, the purchase of a skirt costing $188 AUD with shipping at $27 AUD would attract a duty rate of 17% + 5% GST = $42 CAD by a resident of Yukon. A VAT rate of 25% (on the value of the goods + postage costs) is always payable to the Swedish government. A VAT rate of 20% (on the value goods + postage costs) is always payable to the French government. For example, the purchase of a skirt costing $200 AUD (= €124) with shipping at $30 AUD (= €18) would attract a VAT rate of approximately €28 (= $45 AUD) but no duty since the value of the goods is under €150. The way that customs taxes are calculated by New Zealand Customs is somewhat complicated. It seems to be the case that items with a value of up to around $225 NZD is tax-free. The New Zealand Customs website states that if the customs tax owed is less than $60 NZD, then the customs tax is waived (meaning that the purchase would be tax-free). To check the customs tax owed (if any), refer to the link below. There is a customs tax calculator tool on the website. Alternatively, I'm more than happy to do this for you, and I'll send you a PDF copy of the estimate given on the website shortly. Please let me know which item/items you're thinking about purchasing. ******OTHER COUNTRIES - please check with your country's customs office. If you have any trouble, please message me and I will do my best to help. International customers are responsible for paying any customs taxes (VAT, Sales tax, Duty etc) collected by their respective governments. All prices listed in Ventriloquist Court's Etsy store does not include any taxes. Usually, if there are customs taxes payable on items, they are paid at your local post office upon collection of your package (or, in the case of Royal Mail for UK customers, online payment is available). Whilst I do not receive any customs taxes or have any control over them, I will always do my utmost best to assist customers with locating the relevant information. Australian customers do not pay additional taxes on local purchases. Due to postal issues, Ventriloquist Court® ships only to the following international destinations: USA, Canada, all of Europe, Japan and East Asia, and New Zealand. I currently ship by international economy airmail (no tracking and no signature) for orders UNDER $150 AUD (= to about $105 USD), and by standard international post (with online tracking) for orders OVER $150 AUD (unless otherwise requested). Orders over $600 AUD ship by international express post (with online tracking & signature) and is expected to arrive in 4 business days (to major cities in Europe and the USA). I will do everything on my end to help ensure quick delivery (securely packaging your garment, double checking all forms etc), but please note that the 4 business day express delivery estimate is from Australia Post's website; I personally cannot guarantee it. All items are despatched from Sydney, Australia and lodged with Australia Post. Ready-made items are shipped within 2 business days; and made-to-order between 1 and 4 weeks for most designs, but up to 6-8 weeks for Victorianland gowns (please see the turnaround stated on individual listings). After you have placed your order, I will send you a confirmation message with a more precise turnaround. Once I've posted your package at my local post office, I will send you notification right away. Expect your package to arrive within 1 week for Australian orders (W.A. orders may take a bit longer) and about 2 weeks for international orders, after the despatch date. Most packages to the USA take 6-10 business days. Most packages to Europe take 2 weeks, but usually 3 weeks at most. However, delivery can sometimes take longer. In the event that your package sent via regular airmail (without tracking) should go missing in the post, I offer a full refund on your purchase! Please rest assured that any overpaid postage will be refunded. I have sent postage refunds on differences of as little as 50 cents! If I undercharge, however, I will pay the additional postage fees at my own expense, so that customers can enjoy hassle-free shopping! The good news is that I charge on actual postage only, and not on packing materials and handling. The actual postage amount paid is affixed as a label on the front of the package by Australia Post staff. Purchases of 2 or more items in the one transaction receive a postage discount, which is automatically calculated upon adding items to cart. If you would like signature delivery for orders under $150 AUD, or express post for orders under $600 AUD, please contact me for exact costs and I can then organise a custom listing for you. International express post (EMS) takes 4 business days for packages from Australia to reach major cities in the USA and Europe, and 2-4 business days to reach major cities in New Zealand or in Asia. Please note that all businesses have the right to protect themselves from risky transactions, and to cancel and refund unshipped orders from customers who request shipping to an alternate address (such as to a private courier company or to country which is not their country of residence). Ventriloquist Court® ships only to the address registered to the customer's etsy account. I offer the option of payment in two instalments for any made-to-order custom-size or standard size garment priced at $150 AUD or more. At your request, I can set up a special listing for you to pay the first instalment for material expenses. Once I've made your garment, I will send you photos of your custom order. If you're happy with the finished product, I will then set up another listing for you to pay the other half + postage costs. Send me an etsy message if you would like this option, and I can set up a special listing for you right away! I’m deeply sorry, however I do not have a studio opened to the public. I work in my home studio only, which is not open to the public. However, Ventriloquist Court®’s relatively modest pricing for time-intensive garments and in-progress updates with photos aim to make up for the inconvenience to the customer who would normally be able to try on samples and have access to extensive consultations on garment designs at a studio/ fashion house. 'Custom-made' as offered by Ventriloquist Court® is for a garment that is made to fit a customer. My turnaround for custom-made orders is on average 1-4 weeks, but up to 6-8 weeks for the 'Victorianaland' gowns (please check individual listings for my expected turnaround). This will allow sufficient time for me to pre-wash fabrics which need to be pre-shrunk or to tea-dye, to draw up new garment patterns using your measurements, and to cut the fabrics and sew the garments (and make brooches and put chains together, if this is included). In some instances, I will have pre-washed and tea-dyed fabrics and pre-made brooches beforehand, which significantly cuts down the turnaround time . In any case, please rest assured that I will always do my utmost best to despatch your order sooner than the estimated turnaround. Note that 'handmade' as used in Ventriloquist Court®'s store does not refer to the standard definition of ''made entirely by hand without the use of any machinery.'' 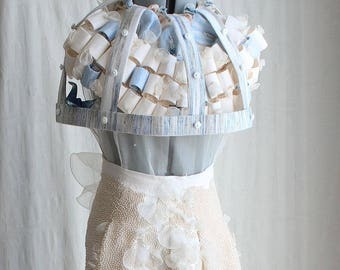 I use the term 'handmade' to mean that I alone have designed (using my own drawn-up garment patterns) and have sewn the items by BOTH hand stitching and machine sewing in my non-smoking home studio, as opposed to assembly-line production in industrial conditions such as in a factory. To fulfil your order, you must provide Ventriloquist Court® with certain information (which you authorised Etsy to do so), such as your name, email address, postal address, choice of payment method, and the details of the product that you’re ordering. In addition, you will also need to provide extra personal information for custom orders (such as your measurements etc) and your phone number for orders over $150 AUD. Your phone number will be used to update your customs form only, and never to be used to contact you for marketing purposes. * Service providers. Ventriloquist Court® engages certain trusted third parties to perform functions and provide services to Ventriloquist Court®, such as delivery companies. Your personal information will be shared with these third parties, but only to the extent necessary to perform these services. * Compliance with laws. Ventriloquist Court® may collect, use, retain, and share your information if it is reasonably necessary to: (a) respond to legal process or to government requests; (b) enforce Ventriloquist Court®'s agreements, terms and policies; (c) prevent, investigate, and address fraud and other illegal activity, security, or technical issues; or (d) protect the rights, property, and safety of Ventriloquist Court®'s customers, or others. Ventriloquist Court® does not transfer its customers' personal information outside of the EU. * Access. You may have the right to access and receive a copy of the personal information Ventriloquist Court® holds about you by contacting Rai Keodara using the contact information below. * Change, restrict, delete. You may also have rights to change, restrict Ventriloquist Court®'s use of, or delete your personal information. Absent exceptional circumstances (like where your data must be stored for legal reasons), Ventriloquist Court® will generally delete your personal information upon request. * Object. You can object to (i) Ventriloquist Court®'s processing of some of your information based on Ventriloquist Court®'s legitimate interests and (ii) receiving marketing messages from Ventriloquist Court® after providing your express consent to receive them. In such cases, Ventriloquist Court® will delete your personal information unless there are compelling and legitimate grounds to continue using that information or if it is needed for legal reasons. * Complain. If you reside in the EU and wish to raise a concern about Ventriloquist Court®'s use of your information (and without prejudice to any other rights you may have), you have the right to do so with your local data protection authority. DO YOU OFFER CLOTHING DISCOUNTS? Very sorry, but the pricing is already very tight. Handmade items are time-consuming. For example, even the simpler skirts take at least 16 hours to make (+ extra time to pre-wash, tea-dye certain fabrics, or to create textile art). I also use quality materials (my high-end fabrics, for instance, cost as much as AUD$84/m = USD$64/m). 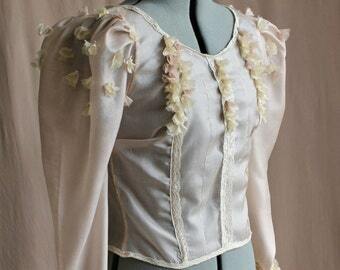 A blouse with elaborate floral buds can use up to eight metres of fabric! Whilst I cannot offer coupon discounts, all customers may expect to see a small surprise in their package! HOW MUCH CONSULTATION MAY I EXPECT? Genuine questions concerning Ventriloquist Court®’s collection pieces are welcome. However, non-paying customers may expect to receive a maximum of four consultations for all garments (except for the 'Victorianaland' collection; for this collection, please expect a maximum of eight consultations as a general rule of thumb). A 'consultation' refers to each time the customer reaches out with questions and requests in one etsy message. Ventriloquist Court® reserves the right to politely discontinue with time-consuming daily consultations spanning over months from a non-paying customer. Time spent on these extensive consultations is time away from current projects. DO YOU DO VINTAGE REPRODUCTIONS, OR CAN YOU REPRODUCE/COPY A DESIGN FOR ME? I'm deeply sorry, but I do not do reproductions of designs (whether new or vintage) which are not my own. 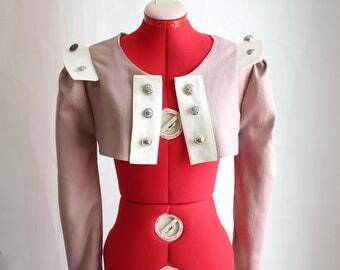 Ventriloquist Court® is trade marked in fashion design. Although inspired by period fashion especially from the Victorian era, everything I create are my own designs using original patterns. I do, however, offer a custom-design service starting from $2, 000 AUD for a gown or other costume. This price includes the time involved in discussing design ideas, creating design sketches for your approval, materials and fabrics, pattern-making, as well as creating the actual gown/costume. My custom-design service is for the finished product only, not for the design. That is, customers may not sell or reproduce my designs or sketches. THERE'S A GARMENT I LIKE, BUT IT DOESN'T SUIT MY EVENT. MAY I REQUEST DESIGN CHANGES? Apologies, I'm currently not accepting any design changes for garments from all collections (with the exception of the 'Victorianaland' collection). Extra time is needed to alter or to draw up completely new patterns, in addition to making the garment itself. 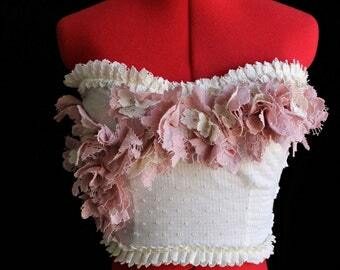 Without the benefit of a pre-made sample, the garment construction would be too time-consuming. YOU'RE BASED IN AUSTRALIA; WILL I NEED TO PAY CUSTOMS FEES TO MY GOVERNMENT? Applicable to many US states, the US government will only impose customs taxes (duty) on international goods if the total value is over $800 USD (= $1, 000 AUD). However, some US states now collect sales tax on online orders, which Etsy collects on their behalf, and will add this automatically at checkout. Please note that all pricing in Ventriloquist Court's Etsy store DOES NOT include VAT. Please see the policies section for further information. Of course, customers based in Europe may expect to see extra gifts, such as antique-style hairbands or scarves, in their package as a thank you from Ventriloquist Court! DO I NEED TO PROVIDE MY PHONE NUMBER TO PLACE AN ORDER? Please include your phone number in the personalisation text box at checkout, for orders over $150 AUD (= $118 USD/ = €98/ = £87). Rest assured that Ventriloquist Court® will use your phone number only for updating your customs form (to be attached to the outside of your package), and never to be used to contact you for promotional purposes. DO YOU MAKE GARMENTS IN XXL-PLUS SIZES? In most cases, yes. If your measurements are the following (bust: over 39'', waist: over 35'', hips over 40''), please send me a message with your measurements prior to purchase for a quote. There may be an additional fee to help cover extra material expenses. Plus-sizes can, depending on the actual measurements and the design chosen, use up considerably more fabric. As a small handmade business, Ventriloquist Court has very tight pricing. 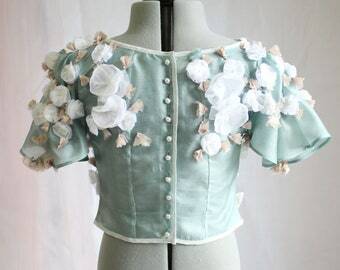 It also takes longer to draw up the garment pattern to ensure correct proportioning as well as to sew and create the garments especially for designs with ruffles, floral buds, and other textile art. Many thanks for your kind understanding and support for handmade. WHAT ARE YOUR SHOP'S POLICIES ON EXCHANGES, RETURNS, & MISSING PACKAGES? IS THE ARTISANAL SILK YOU USE CERTIFIED CRUELTY-FREE? NO. Ventriloquist Court only uses peace silk purchased from artisanal fabric suppliers, supporting traditional textile weaving which helps to empower rural communities. However, currently, no certification body exists to oversee and certify the cruelty-free production of peace silk. Customers with any concerns are more than welcome prior to purchase to ask for a quote for a change in fabric; for instance, where available, linen could be substituted for silk, plant-dyed cotton or vintage cotton for regular cotton, etc. Please message me to discuss possibilities. WHAT ARE VENTRILOQUIST COURT'S CONTACT INFORMATION? *****Please email or message me via etsy to obtain my full address and/or phone contact, if you need to exchange items or would like to discuss orders over the phone.